Mac Rumors: Steve Jobs stated in an email reply that AirVideo Streaming is coming in 2011 for Safari and third-party applications. This is a welcomed news as many where left wondering if Apple had plans to enable AirVideo for third-party applications through an Xcode update. The current AirVideo API are private and can’t be used by non Apple developers. Jailbreaking developers have written a small hack that proves that AirPlay can technically stream third-party video to the AppleTV2. So do not despair to get AirVideo from your prefered application sometime next year without resorting to Jailbreak your iDevice. 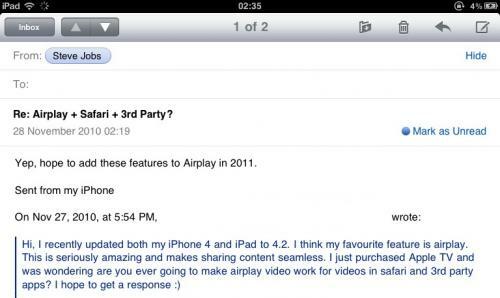 I personally think that the new AirPlay for third-party application will be made available when the iPad2 launch in 2011. Maybe the iPad2 will have some exclusive game video to AppleTV integration? I speculate that such a feature might require a new processor that can handle encoding of output video on the fly for proper streaming to the AppleTV2… maybe through a multi-core CPU design with dedicated screen output to mp4 transcoding? I would like AirPlay to stream video TO my iPad/iPhone without using a 3rd party app.